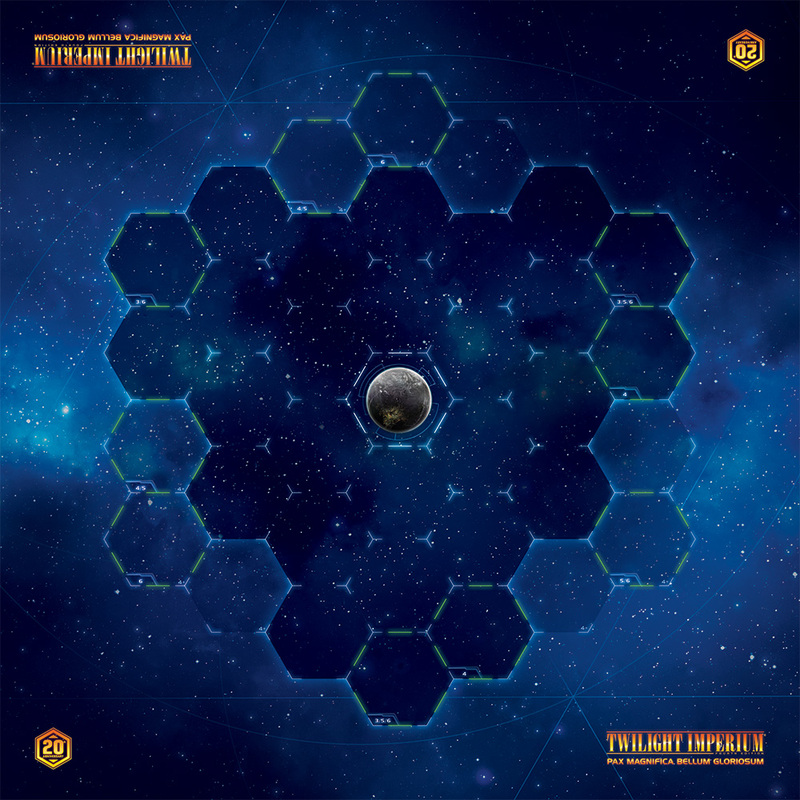 No two games of Twilight Imperium are ever identical—at the start of each galactic age, the game board is uniquely and strategically constructed using 51 galaxy tiles that feature everything from lush new planets to supernovas, from asteroid fields to gravity rifts. 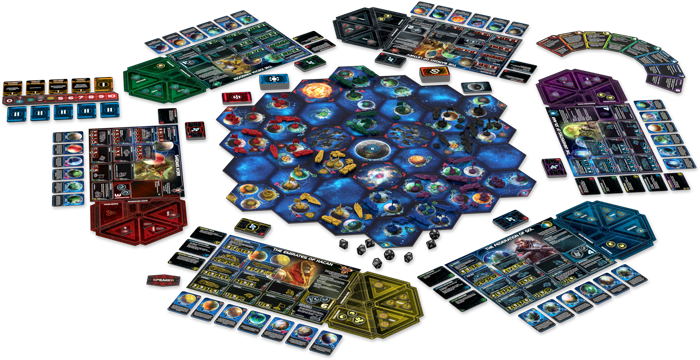 Players are dealt a hand of these tiles and take turns creating the galaxy around Mecatol Rex, the capital planet seated in the center of the board. An ion storm may block your race from progressing through the galaxy while a fortuitously placed gravity rift may protect you from your closest foes. The galaxy is yours to both craft and dominate. 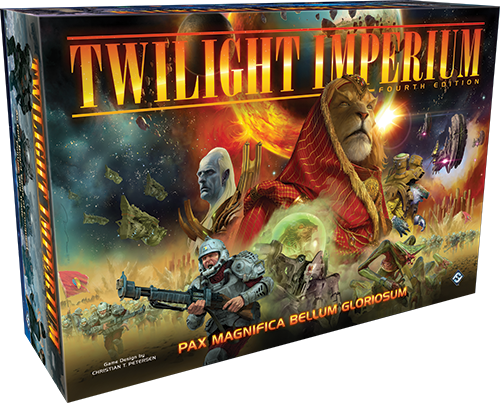 A round of Twilight Imperium begins with players selecting one of eight strategy cards. These cards both determine turn order and provide players with special abilities in the realms of ship movement, trade, technology, and more. 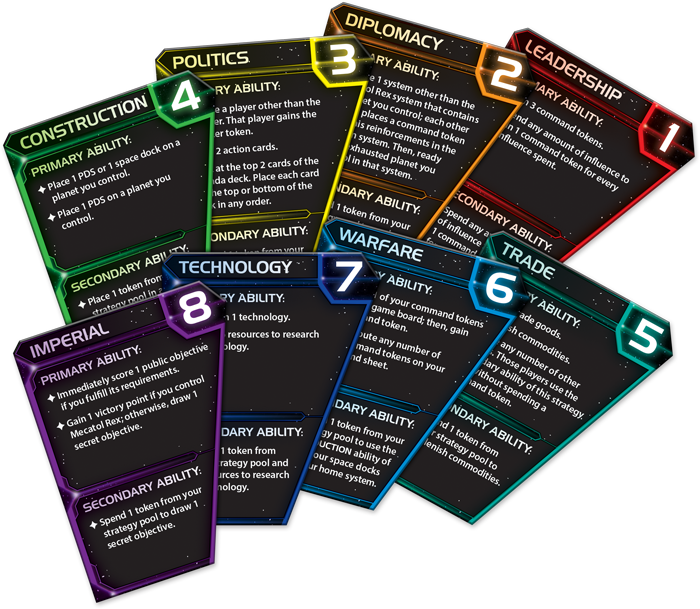 The Leadership strategy card allows a player to gain additional command tokens for their fleet. 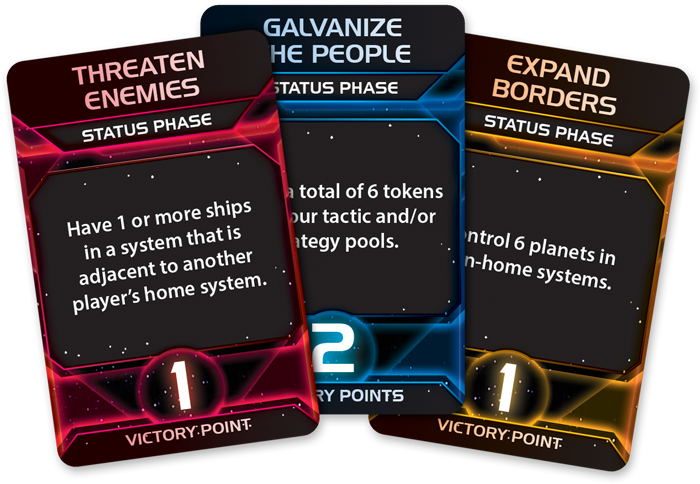 After this phase, players will then take turns exploring the galaxy, claiming new planets, engaging in warfare, and activating their strategy cards. Players do this primarily by using command tokens separated into three distinct areas on their command sheet. Command tokens in the tactics pool may be placed on galaxy map tiles to activate those specific systems, meaning your ships in nearby systems may move in to them. If those ships carry ground forces, they may land on unclaimed planets in that system and add them to your empire, giving players additional resources to construct ships and research technology, and additional influence to vote in the galactic council. The blue player activates the system containing the planet Tar'mann. They can then move ships to that system from a distance equal to or less than that ship's movement value. The carrier and dreadnought both have a base movement value of one, so they may move in from adjacent systems. The carrier brings an infantry unit with it, and the blue player places that unit on Tar'mann, claiming it for their empire. If there are another faction’s ships in the activated system, your forces and theirs collide in an epic battle. In battle, players will roll one ten-sided die for every participating ship—should that roll be equal to or greater than the ship's combat value, a hit is assigned to the enemy. After all dice are rolled, players assign the hits rolled against them to their ships. Some ships may only take one hit before being destroyed, while others with the “sustain damage” ability may take two. 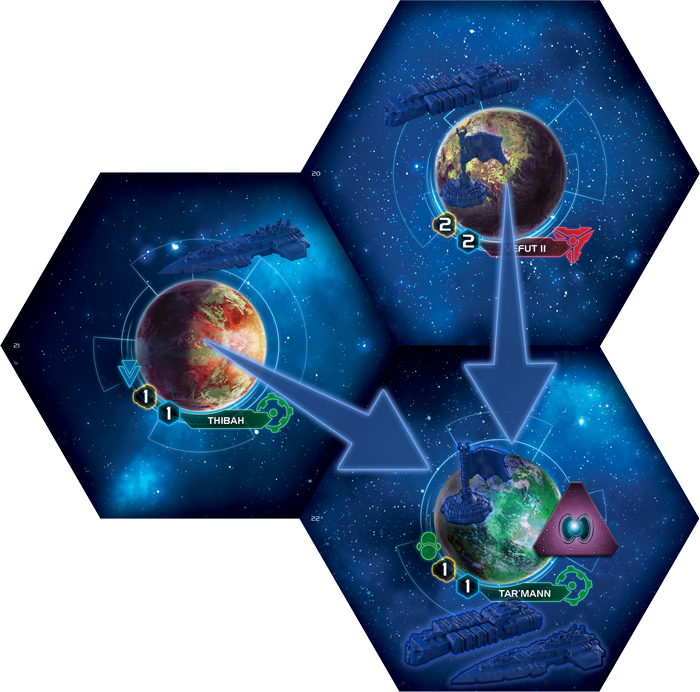 The process then repeats, with both players having the opportunity to declare a retreat and moving to a friendly adjacent system at the end of the next round of combat. Command tokens are also assigned to the strategy allocation area. While the eight strategy cards give their owners unique actions, when they are used during a turn, every other player gets the opportunity to use the secondary ability on the card, often by spending a command token from the strategy pool. This keeps every player involved even when it isn’t their turn, giving them the opportunity to use powerful effects at the cost of a valuable command token. The final area for command tools is the fleet pool, determining how many of their ships can be in one system at a time. Your fleet will consist of a variety of these ships, represented by plastic miniatures in six different colors. Carriers ferry your infantry from system to system, the mobility of Cruisers makes them perfect for exploring new systems, Dreadnoughts provide heavy firepower for your fleets, Destroyers are perfect for picking off enemy fighters, PDS units defend your systems, and the mighty War Sun's devastating firepower is unrivaled in the galaxy. Additionally, each faction comes equipped with their own unique flagship that synergizes with their unique abilities. A round continues until all players have passed, then the status phase begins. Here, players can claim a variety of public and secret objectives that earn them victory points. These can be anything from engaging in friendly trade to invading a player’s home system. These objectives steer the direction of the game, and with forty different cards, every game will have a different focus. The first player to earn ten victory points wins the game. Finally, if a player controls Mecatol Rex at the center of the galaxy, players then participate in the agenda phase. The Speaker will draw a card from the agenda deck and prompts a vote that will change the flow of the game. Some cards may award an elected player a victory point, while others may restrict trade or construction. Players then vote on the card using the influence values shown on their planets—whichever choice has the most votes in the end is enacted as law. Players will trade valuable resources and favors to get the result they want; often a single law is enough to shape the game to your favor. Canny players should bear in mind that this happens twice each round—going all in on the first vote, though it may benefit you greatly, could prove to be a dangerous proposition. Players should try to divide their votes responsibly, lest they get stuck with an unfavorable, and insurmountable, political obstacle.